Late post before I retire for the day....but I just had to share these! Loaded on TpT and ready to race! 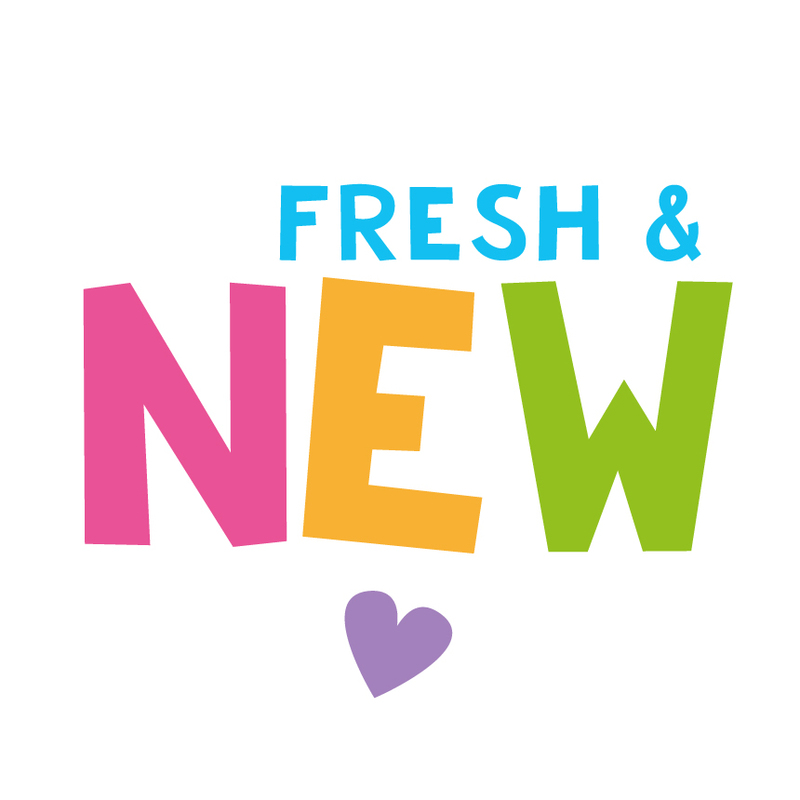 There were a couple of things that inspired me to write this blog post, one being the launch of a new product that has been way down on mt to-do list for a few years. A Nursery Rhyme edition in our My First Readers series. Another was a conversation I had with some friends recently about new readers. This post will have information that many followers will already know. 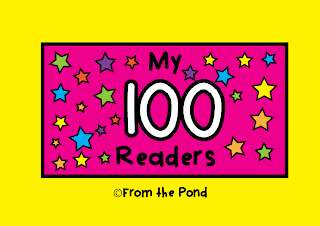 I am aiming it more at blog readers, new teachers, mums and dads that might be looking for some more information about beginning readers........ and beginning readers. 'Beginning readers' - ie. children that are just beginning to learn to read. 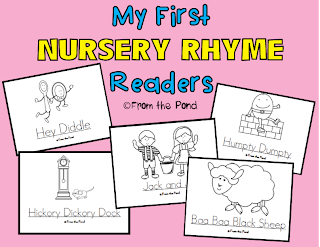 Our latest set of 'Beginning Readers' has a nursery rhyme theme and the set includes 5 little readers. Nursery Rhymes make an excellent topic for beginning readers as the students are very well supported by their knowledge of the words to the rhyme. As they are decoding the text they will use this knowledge to help read unknown words. 'Readers' are essentially books. But they are special books. They are written especially for students that cannot read independently. Readers have special features that aim to help, or 'scaffold' a new reader on their journey to becoming literate. Readers help students to feel successful as they learn to read. We have a 'starting star' on each page of all of our readers, to help direct students to the starting position and to read from left to right. Use a 'starting star' when they are beginning to learn to write as well. It will help sort out that issue where they want to write backwards and from right to left! 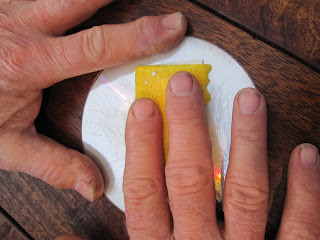 Our readers are very easy to make. Each reader starts as 2 pages to print out. Keep these as a 'master copy' in a folder designated just for readers. 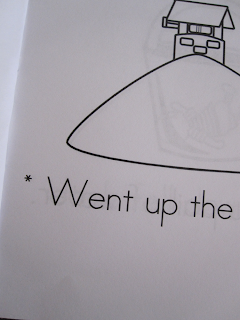 Feed the 2 pages through the photocopier and get them back-to-back. You may need to experiment with your feed tray to achieve a copy that is back-to-back but both pages with the text facing the same direction. Once you have your back-to-back copy, you just need to fold and cut it down the centre. If doing a whole class set, this can quickly be done with an office guillotine. Then place the half-pages on top of one another (check they are in reading order). Then, just fold the pages in half, and staple at the side. You get one whole 8 page reader from just ONE piece of paper! 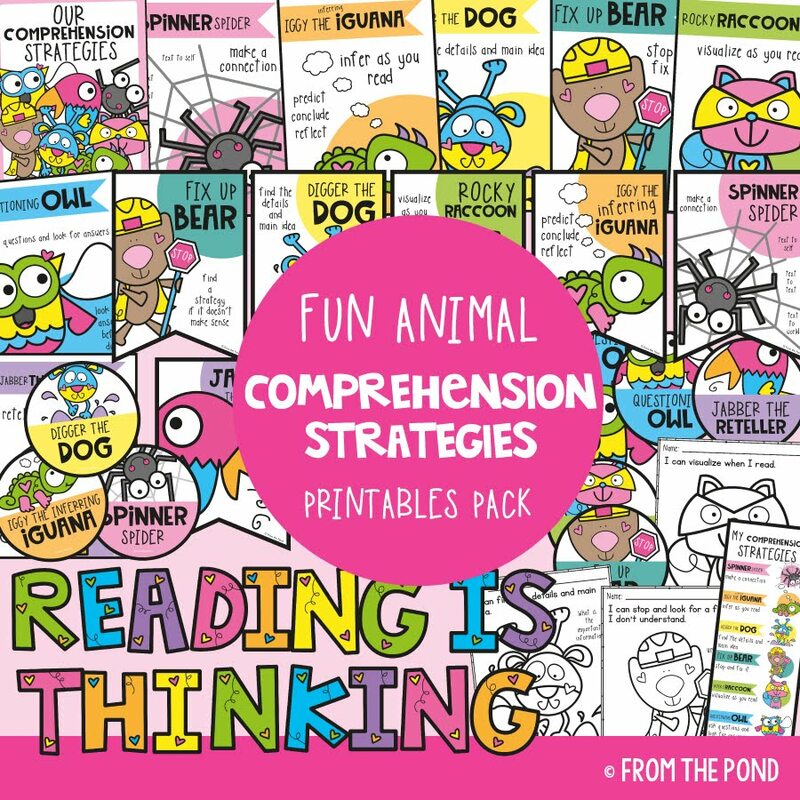 Our My First Readers packets include a worksheet for each text. 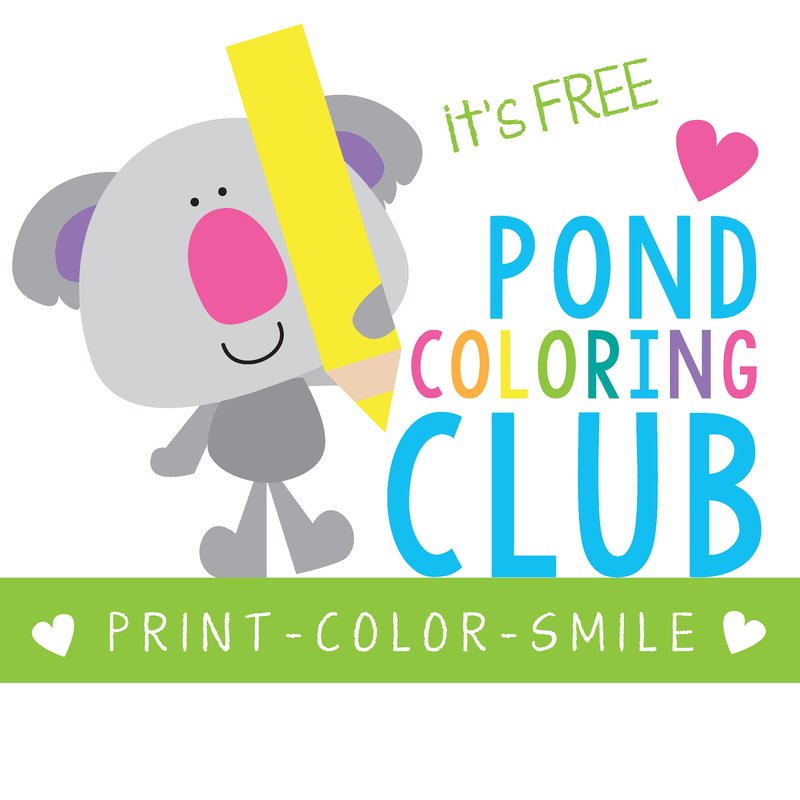 Students will complete activities that require them to attend to the print in the readers. 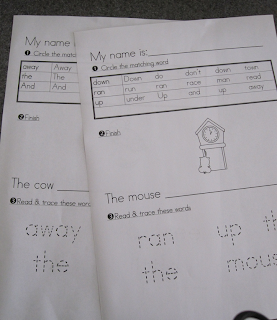 Each worksheet has a visual/word discrimination task, reading/writing task and a handwriting task. 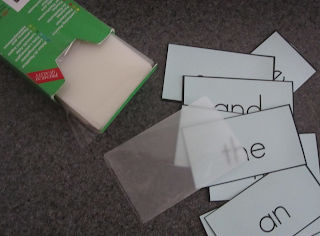 The packet also include word cards and instructions for a few easy 'flashcard' games. 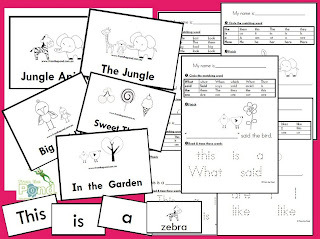 These games will assist your students in learning to recognise the sight words that occur frequently in the texts. 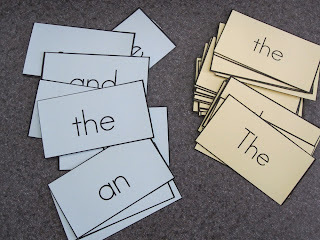 Copy these cards onto different colours to make them easy to separate and locate. The cards have been formatted to fit easily in credit-card sized laminating pouches, if you wish to laminate them easily. 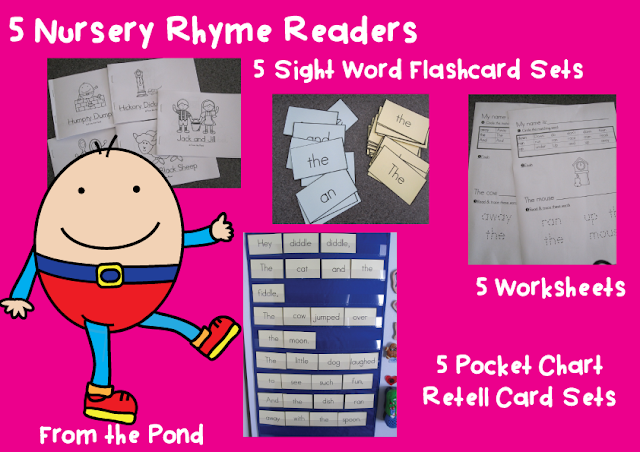 Our Nursery Rhyme Readers packet also includes word cards for your students to retell the nursery rhyme using a pocket chart. 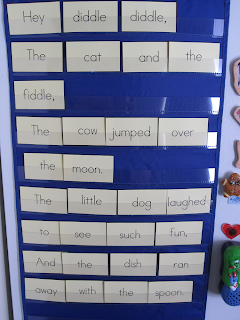 You could encourage them to use their mini-reader as a guide, or try to sort the cards in the correct order independently. 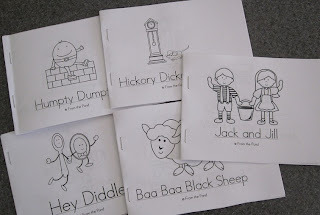 So, the resources in the Nursery Rhyme packet will allow you to implement four different activities for each of the five readers - perfect for a morning literacy session. The students could read the text, play a sight word card game, retell the rhyme with the pocket chart and then complete a worksheet. 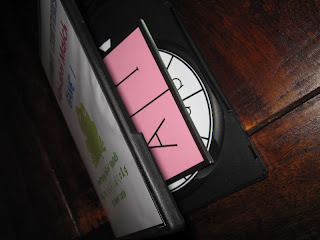 You will find all of our My First Readers packets at TpT and our website. 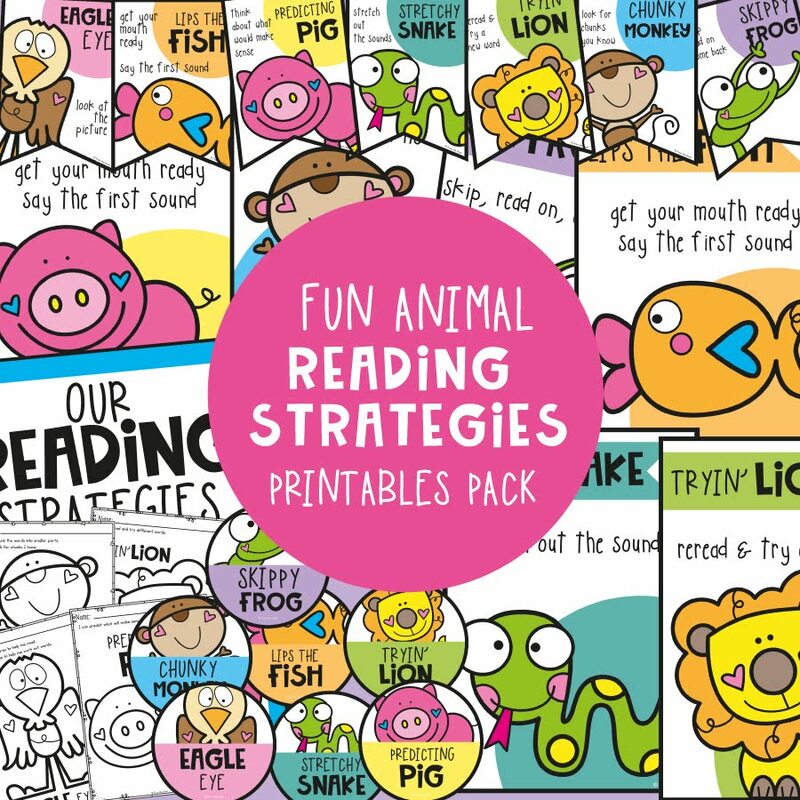 Another GREAT way to support your students learning to read is to help them to VALUE their readers. I have seen this idea work beautifully, and the real key to unlocking its potential is for the teacher to REALLY show they CARE about the students' reading and readers. When the students see that is genuinely important to the teacher, they will follow! 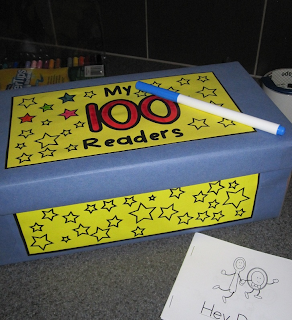 Help your students to make a '100 Readers' box. Create a special place in the classroom for students to keep them. Make a big fuss about them and the stduents that are looking after and using their readers. 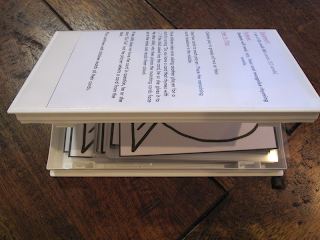 This box is for storing all the paper mini-readers that the students receive in class. You can house these boxes in class for the week, and students can take them home to share with their family for the weekend. What a gift it will be, to make sure the students in your care, all have at least 100 'books' to read. First, cover an unused shoebox with coloured paper. I covered this one today, and it took me about five minutes. 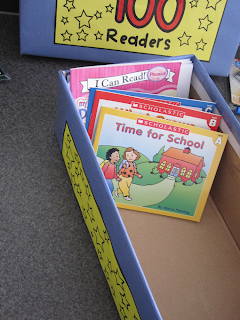 You can also ask the students to bring along a box already covered, especially if you are starting this idea at the beginning of the school year. A shoebox is perfect as it fits little paper mini-readers perfectly. Commercially produced 'readers' will fit in a shoebox as well. There are five labels to glue onto the box. Each label has 25 stars. As each book is added to the box, the students will colour a star with a marker. 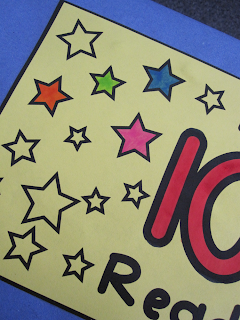 The aim is to have all 100 stars coloured. Your students will love working towards having all 100 coloured, and it is a good way to incorporate some number work as well. You may like to 'buddy up' with an older class in your school. The students will enjoy reading with one another. The older students always enjoy assisting younger students and your new readers will be proud to 'show off' their books and growing reading ability. 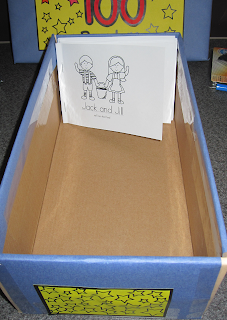 You can download the labels and instructions for making a '100 Readers Box' FREE at TpT HERE. Thanks for getting to the end of this long post. Please leave a comment and let me know of any special things you do to help your 'beginning readers'! Proud Like Only a Teacher-Mother Could Be! My husband has been busy the last few months, downloading apps for my daughter on the ipad. Some of the educational ones are somewhat a waste of time interesting to say the least, others are wonderful. 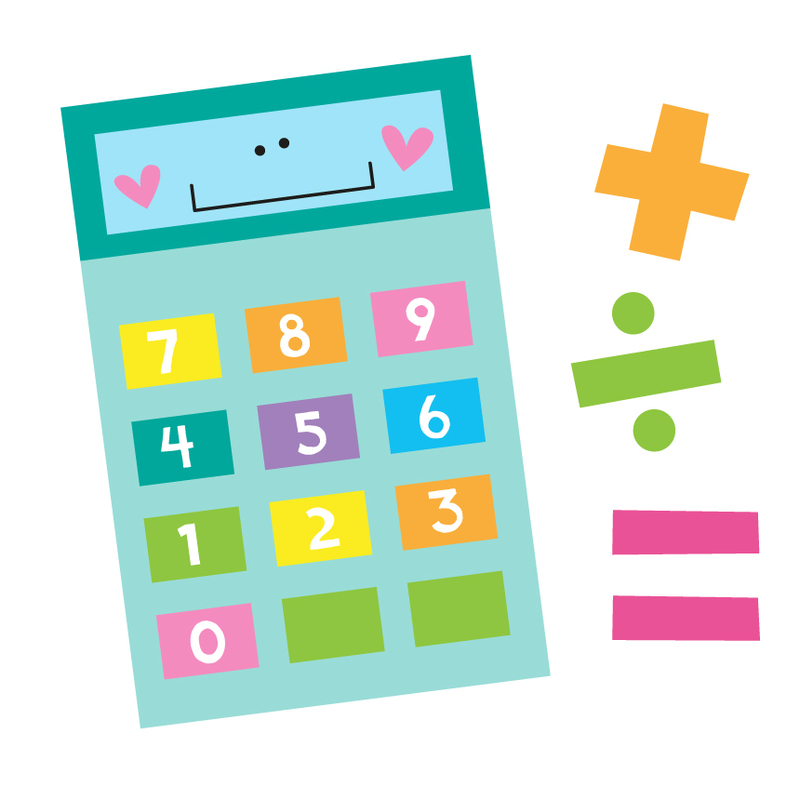 One new app is supposed to teach little ones to add. 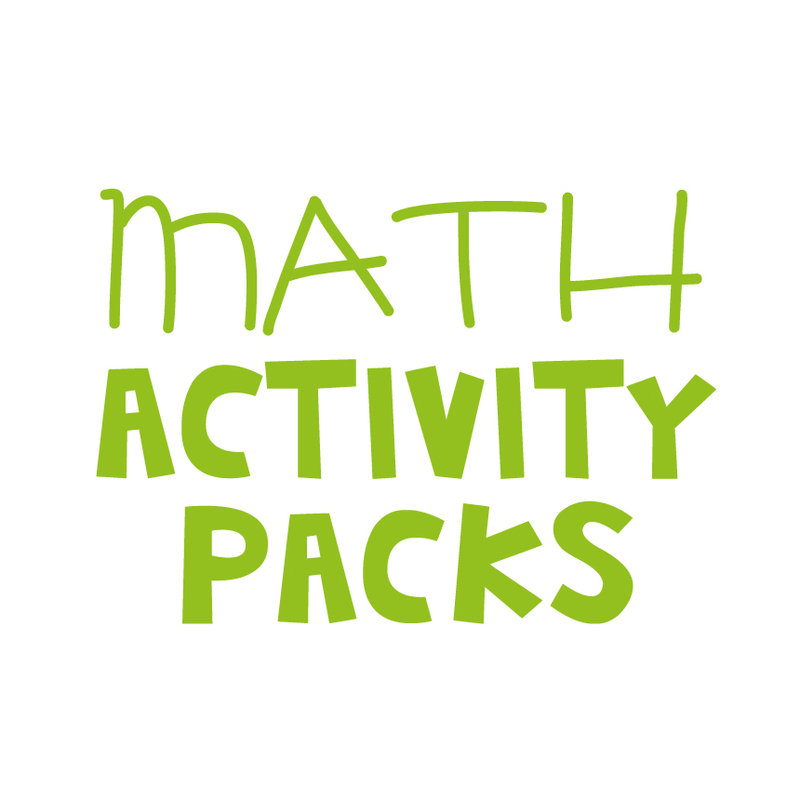 It launches straight into addition sums, like 4+3= . Although my daughter has been doing some 'school work' at home with me this year, in preperation for her start to school next year, I try where possible to make all the activities 'hands on' and that help her to build her understanding of a concept before she attempts abstract ideas like 'sums' in school next year. Anyhow.... my dear hubby attempted to 'teach' addition when she found this new app. Of course, I sat smugly in the corner, preparing to witness a train wreck. He lasted a few minutes, told her how to count using her fingers on from the first number. So if it was 3 + 2, she should say 3 and then count 2 more numbers. Luckily she grasps things quite quickly and I was surprised that she did OK with the first few. My daughter was left alone for a while with the app. I was busy on the computer, my head down working, but I kept and ear out to hear how she was going as she progressed through the sums. To my amazement I heard her developing a strategy to work out sums that required more fingers than she had on her hands! Totally spontaneous and completely her own attempts to figure out an answer. The question was 9+6. I heard her say "one ten... two eleven.... three twelve.... four thirteen....five fourteen......six fifteen". I was blown away by her creativity and very very proud. I just had to share this with some teacher friends that would understand my excitement. We have some standard testing here in my state for working out a child's level in maths and we always try to get the children to reveal the 'strategies' they use to work out answers. It is difficult, as most of them have no idea how to explain how they are thinking. I love it when they say 'I just thinked it' in response to my question 'how did you get that answer'. I am sure if I asked my daughter she would not know how to explain this strategy that she used to solve the sum and perhaps not be able to do it again. I am so glad I was in the room to catch this little revelation into the inner workings of her mind. 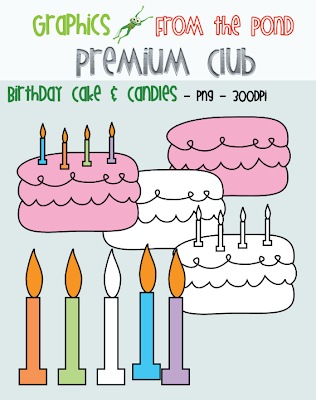 I made these cute birthday cake and candles by request for my Graphics Premium Club. They reminded me of a little action rhyme I like to do with my Kinders. They can 'act out' the steps. I love doing these as warm ups before my drama lessons, or to help them "get their sillies out" before we start a lesson. 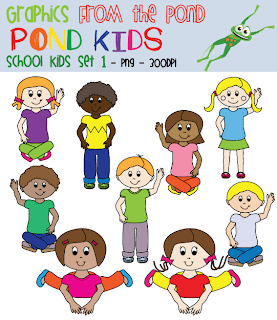 I have finally started to list my 'Pond Kids' at TpT. They have been a few months of work. 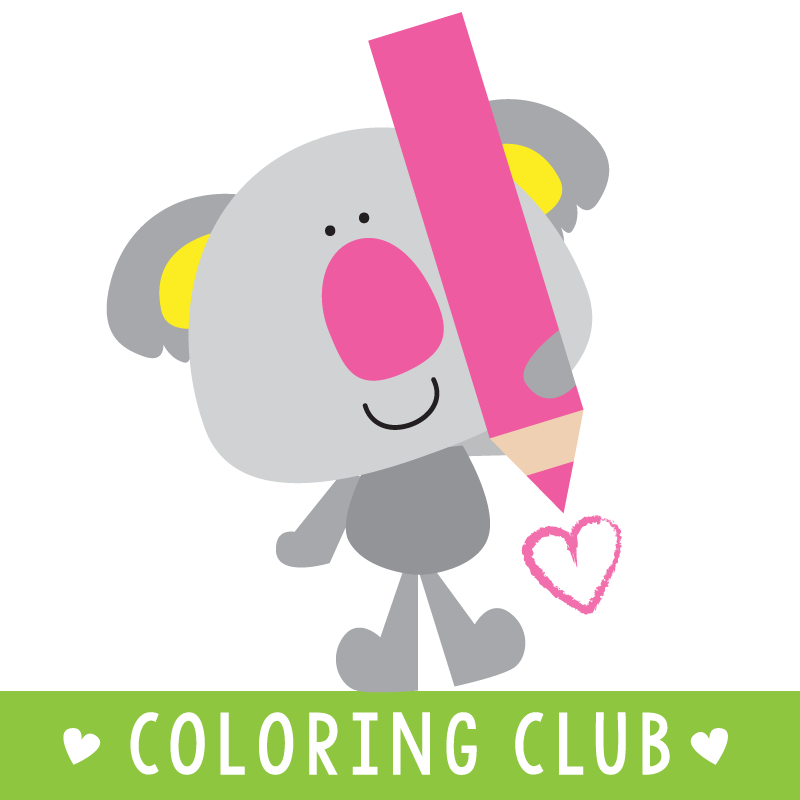 I am planning to develop a whole range of kids to go with different themes and topics, so if you need any in particular, be sure to let me know. Some of these 'positions' have been requested. 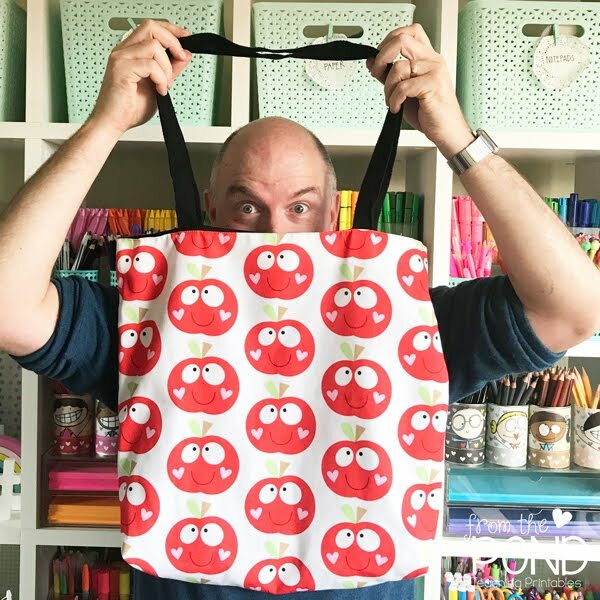 I can't wait to see them on some lovely teaching resources, be sure to drop me a message to link up with how you use them. I collaborated with one clever man to make this product - my Dad! I know I am biased, but my Dad is awesome. There is nothing he cannot do. No problem he cannot solve. I feel blessed every day that I get to be his daughter. He is one very very special man. It all started with some VHS cassette tape cases I purchased about 7 years ago. My husband (another very clever person) groaned. I purchased about 100 of them. They were just ten cents a packet you see, and I stood in the shop and decided that I could use them for storing games and activities in my teaching cupboard. I would use the cover sleeve for an attractive cover or instruction sheet, and keep the contents of the game/activity inside. Well it is very hard to find VHS boxes now. I can only find DVD cases. And it got me thinking. And when I start thinking..... it tends to end up.... how should we say..... well, lets just look at some pictures! Here is our first "Spinny Center". The idea is that you can use old or unwanted DVDs and their cases to create a center. 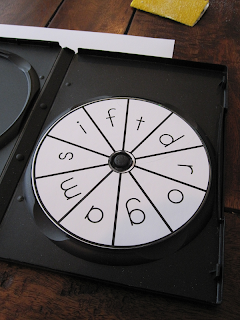 The DVD and case become the spinner and you house all the game boards and counters in the case. 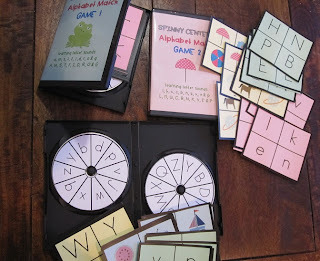 Here is the finished set of "Alphabet Match" spinny centers - 3 center sets to learn upper case letter, lower case letters and match to pictures. Each set has 15 game boards and 2 spinners. But let me just say - after I had my initial idea, I ran into a few troubles. The DVD did not spin so good. It would go around, but not enough for how students would expect a game spinner to spin. I researched, googled and looked at pinterest....nothing helped with how to get a DVD to spin in a case designed to keep it locked down. My dad came over for a cup of tea, and I shared my dilemma. "I think I will shelve the idea" I told him. But....we both could not let it go and laughed at the irony. Some clever designer somewhere has made the DVD cases so that the DVD will not move too much, and here we were trying everything possible to reverse their design. 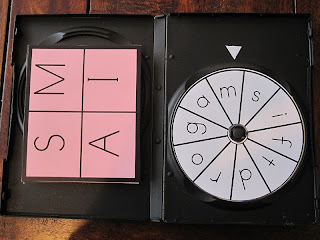 We had all sorts of 'classroom bits' over the kitchen table to experiment with - elastic bands, split pins, brads, blu-tac.... we even used a marble at one point in the hope of creating some sort of addition to the case to make the dvd spin, that teachers would have readily available. Dad told me not to give up, it could be solved. He came by a few hours later with a very very 'spinny' CD! I was thrilled! 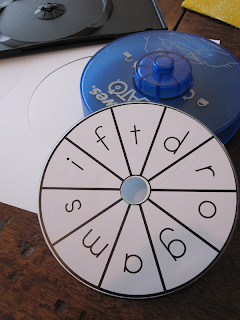 To get the DVD to spin in its case, you just need a little bit of energy and a piece of coarse sandpaper. A job for the teacher, NOT the students! Here is my dad preparing a DVD to show me. The amount you need to rub will depend on your case. A few other little tricks are shared in my file. Here I printed a DVD label. 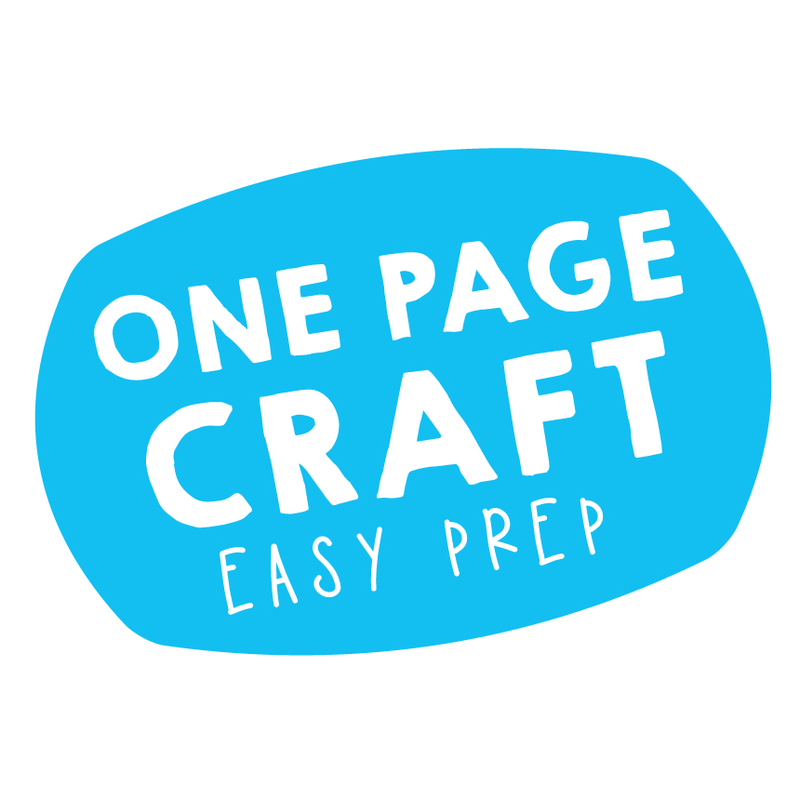 These labels will vary depending on what brand you purchase, so I have included the labels in a WORD file so that you can adjust their position on the page to suit your labels. The great thing about using printed labels is that you can recycle your kids old DVDs that are scratched or broken by sticking a new label on! Pop the labelled DVD back into the case, and lock it down. Cut a corner of the sticky paper that is left when you peel the label from its sheet, and use it as the arrow for the spinner. Cut your game boards and pop them in the case. Voila a nice tidy little center activity for your students to play! Imagine lots of these all lined up in a DVD case! I cant wait to get a few more ready and get them all organised! 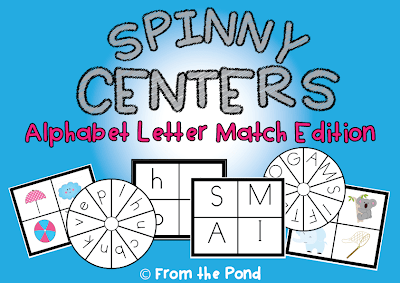 We have some 'Spinny Centers' planned for maths and spelling, ready to list very soon. Now I am hoping that I can turn the 'idea' section in my brain off for a while and get my kitchen cleaned! I helped a friend yesterday with some ideas for teaching her son the combinations that make ten. Apart from using ten frames to visualise these combinations the idea of "friends of ten' is a good one. It helps for students to know these instantly - 1 and 9, 2 and 8, 3 and 7, 4 and 6, 5 and 5, 6 and 4, 7 and 3, 8 and 2, 9 and 1. Use connecting cubes is a great way to first introduce this concept, as you can 'build' the combination and then flip it around to show the reverse is true (so in the example below 2 and 8 and 8 and 2 can be seen by simply reversing the stick of cubes). Here is a little way of helping your student to BUILD their understanding using some hands-on equipment. I used 2 yoghurt cups that had not been split apart. Encourage your student to count with each 'drop' of the cube into the cup. This will help with 1:1 correspondence. 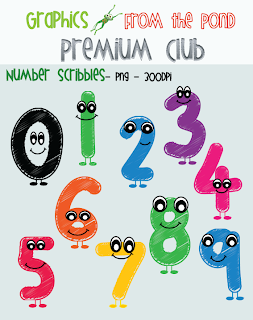 I have just sent my Premium Club members their graphics for today, some 'finger counting hands' that will be great for maths activities and worksheets. A listening lesson is perfect for the first days on Kindergarten. Another simple reinforcer for good listening behaviour is a simple clapping call-and-respond. Just clap as you call - “Thank- you-Jo-sh-u-a” for example, and add a clap to every syllable. The children clap and say this back. It serves very well as a getting-to-know the names of the class activity, listening and language activity and best yet, settles their behaviour as they try to be the next person named (select students displaying appropriate behaviour and make a nodding gesture toward them as you clap and say their name). The 'thank you' is a positive message to reinforce too. Clap around ten names, or at least until the whole class is settled. It is a great way to keep some of the students busy while waiting for other students to tidy their desk and return to the mat. After a day or two in Kindergarten, establish some classroom rules with the class. Start with a general discussion on what a ‘rule’ is and talk about their homes and family rules. Discuss the rules they have at home, what consequences occur when they break rules and why we have rules at all. It is always a very interesting discussion. You will need to be sensitive to the social and cultural context of your school. Take suggestions for a set of rules in ‘our’ classroom. 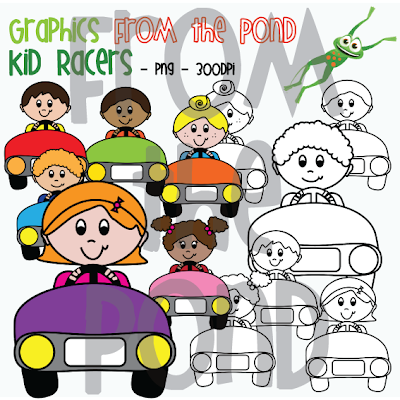 Write them all down on chart paper (quickly draw matching pictures as most cannot read yet). Take all suggestions and then work through the list, verbally grouping the similar rules e.g. a student might say that a good rule to have in the classroom is ‘do not run’ and another might say ‘don’t run with scissors’….. I suggest to the students that these two ideas might be grouped together as ‘we move safely in the classroom’. Most ideas that are suggested by students can be grouped into a short list of basic rules that are broad enough to cover lots of things but specific enough to promote positive behaviour. 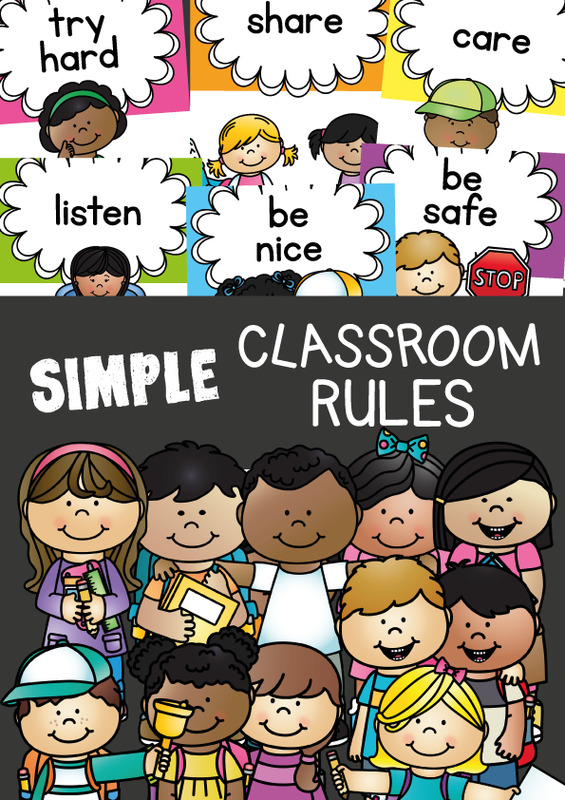 We have a ‘Simple Classroom Rules’ packet for sale on TpT. This is a printable resource kit that includes the pieces you can print to make a Classroom Rules Poster for your own classroom. 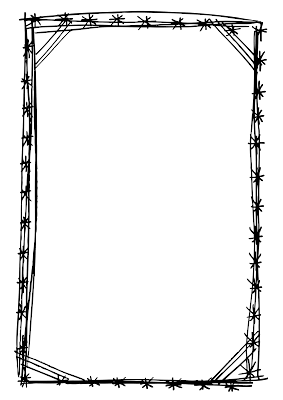 You can use the pieces included in this file to paste on your own cardboard poster, classroom door, window or noticeboard. Each rules has a colourful picture to help those students not able to read yet. I had to share this little bit of randomness today. 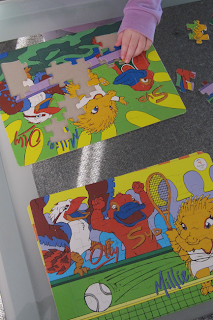 I found these Sydney Olympics puzzles when I did a recent clean-up-organise-and-pack-away of all my teaching resources for my maternity leave. I purchased them 12 years ago when I was doing my Internship at uni for my teaching degree. My Internship fell right at the time of the Sydney 2000 Olympics, and my task was to write a 4 week unit of work on learning about the Olympics. 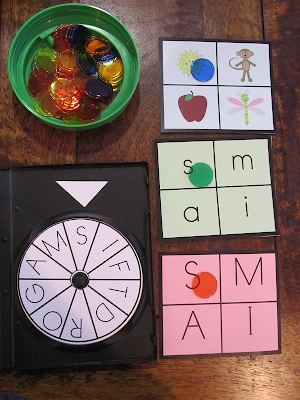 I had these puzzles as one of the play activities for the Kindergarten class I taught. I am planning to dig out my unit and see if it something I can share as I am sure there are many teachers planning some Olympic units right about now. My premium club friends will find two lovely sets in their inbox this morning. 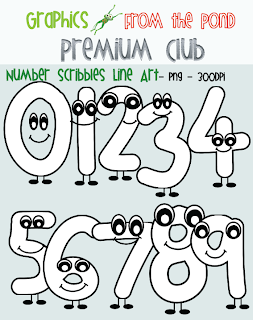 Some little number scribble characters. If you want to find out more about Premium Club, head over to my website, or just email me direct using the contact details here on my blog! No Hat No Play - And Put Your Hand Up! Gee the blog title today sounds a little cranky doesn't it! Thankfully these days most schools in Australia have to have a Sun Safe policy, and most have a rule 'No Hat...No Play' - or the more politically correct 'Have Hat....Will Play". Ann from Hippity Hop Teacher Spot and I have been collaborating on some exciting interactive readers featuring her very cute (and full of attitude) pet rabbit Stormie. 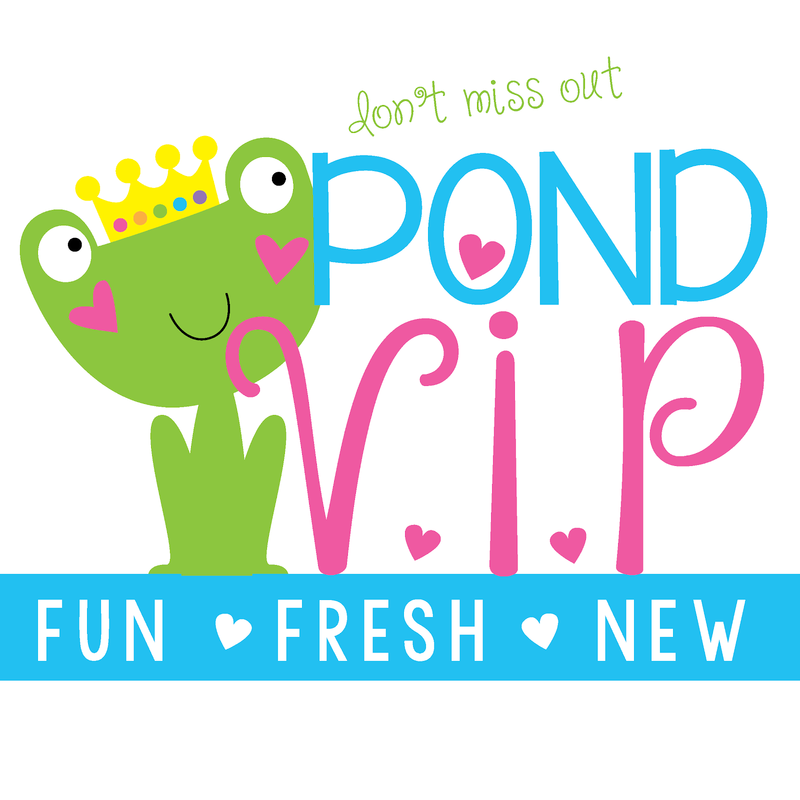 One of the readers features Freddie Frog and it is all about protecting your skin in the sun - perfect for Australian students. Mt favourite way to introduce my students to sun safety is to talk to them about skin and the sun, then with the students, place a big ball of playdough out in the sun for a few hours. It always has a big impact on the students to compare the soft plump smooth surface of playdough that is inside, to the playdough that has been left out in the sun. This is a good springboard for talking about how we can protect our skin from the sun's harmful rays. Here is a sneak peak at the reader Ann had written and I have formatted. We are almost ready for listing! 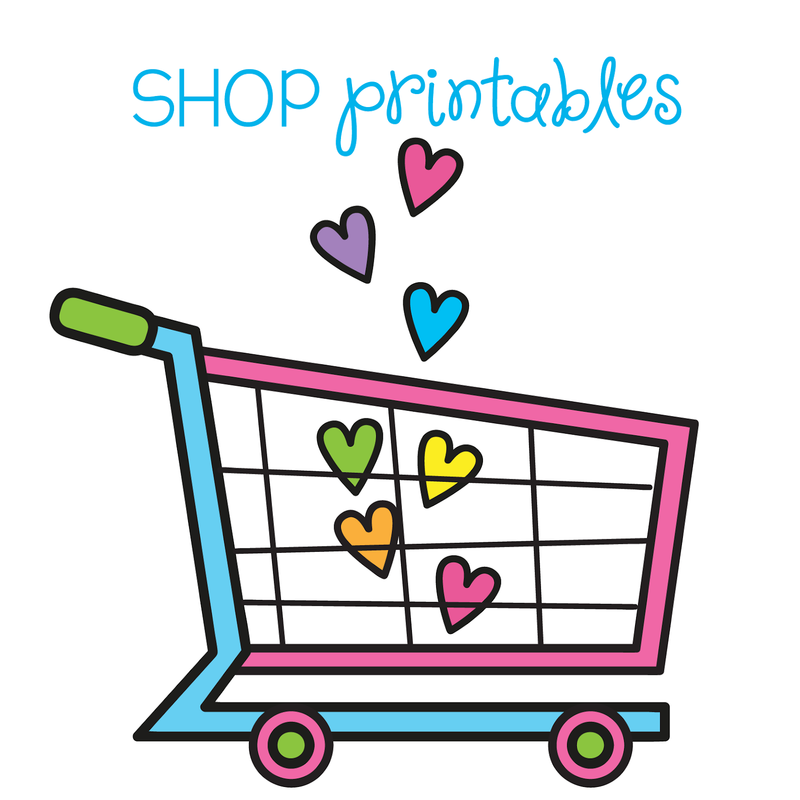 Be sure to follow Ann's store so you know when it gets listed. 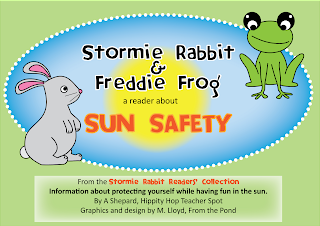 We have also created some very cute 'Sun Saftey' posters for the classroom. These will be very useful in Australian classrooms that have the 'No Hat..No Play' rule. 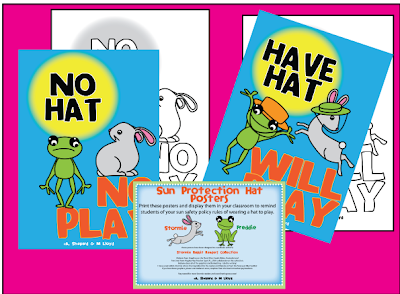 You can find them in Ann's store on TeacherspayTeachers HERE The file includes 2 colour posters, 2 blackline and a blank bordered page for students to design their own sun safety poster. 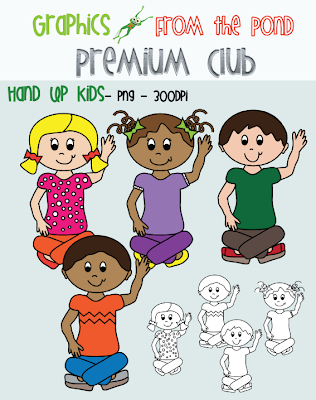 My lovely premium members, you will wake up to find these very cute 'Hands Up' kids in your inbox! Happy Monday! 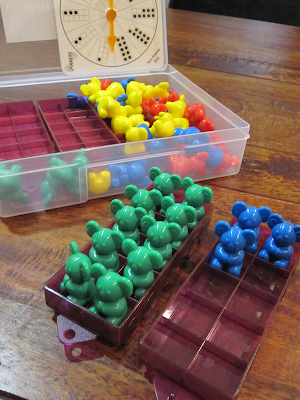 I have blogged before about how much I love ten frames! I just had to share these adorable koala ten frame trains that I recently purchased from Educational Experience....for my daughter....really... they are not for me ;) I have drooled all over admired sets before at work when the educational supply people set up a display in the staffroom, and I have never had enough $ in my class budget to get them... well the cheque arrived from TpT this week and I got them! My daughter has already had lots of fun 'playing' with them, lining the koalas up in their ten frames and I am beginning to encourage her to memorise the arrangements for different numbers. Here we have modelled the number 13 and have talked about how it is 3 more than 10. Or 1 ten and 3 more. You can make your own ten frame trains by pulling two sections from an egg carton - which is what I have always done in the classroom. 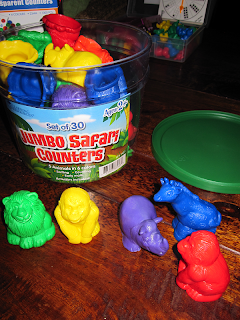 Students can then fill the spaces with counters or animal counters - here my daughter has used Jungle counters, also from EE. 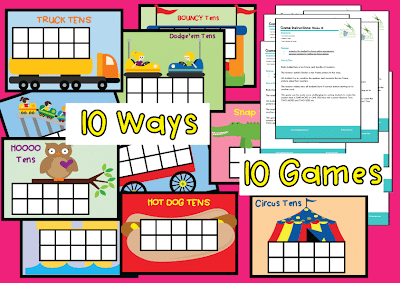 I have combined ten of my favourite games using ten frames with ten colourful and fun ten frame boards to make this new packet. 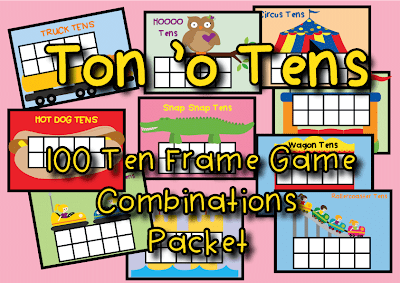 The whole idea of using ten frames is fro your students to build solid visual representations in their mind of the numbers to ten, so I have kept the ten frames in this packet as clear and standard as possible, but adding additional elements (such as an alligator) to make them fun! This consistent representation of the ten frame will help your students enormously! Click on the images below to find it! I am off to play more koala ten frames! Sit Up Straight and Listen! Thankfully teachers these days have far more effective and clever ways of gaining students attention and getting them to listen and pay attention. 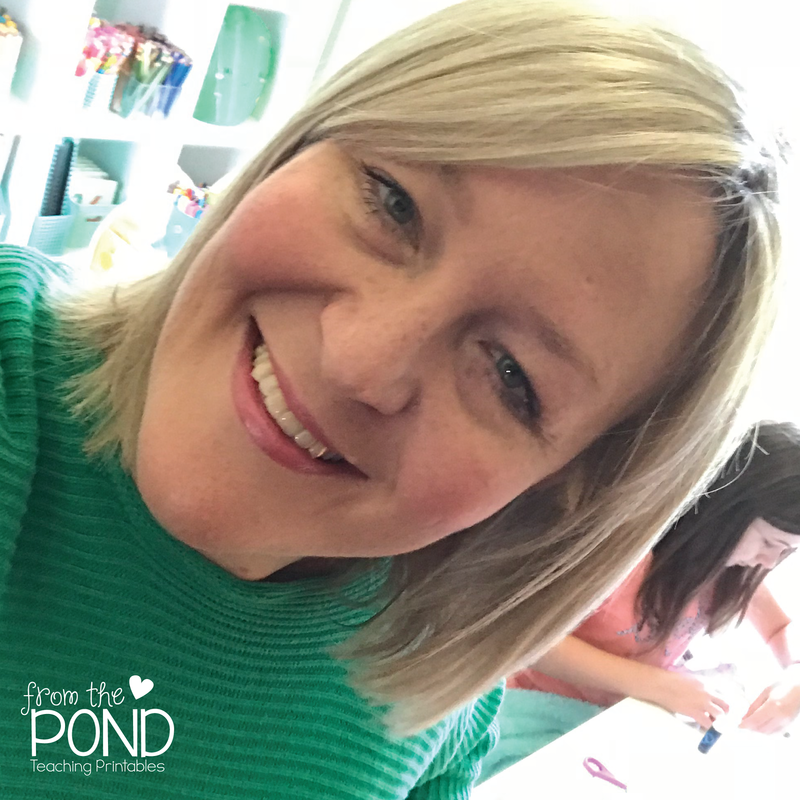 I have outlined my favourite way to TEACH my little learners about listening in this fun new packet of mine on TpT. It is great for students that have never really learnt about HOW to listen, and is good for these students that already know, as they probably were never aware of what they were actually doing. I will outline the lesson here as well, and you can head over and see the packet if you would like the associated resources to go along with it. I saw this lesson at the beginning of my teaching career somewhere, and I wish I knew where so I could credit it, but just one of those things I picked up along the way. I teach is EVERY year on the very first day of Kinder and the kids LOVE it! I perform it really, put lots of exaggerated actions in it and really pretend I don't have a clue about listening. The kids get a real kick out of it and half of them roll around on the floor laughing very hard! It is a great way to INTRODUCE listening for the first time, and create a shared experience about listening with your students. You can then refer back to the 3 main points as you manage them through the year. Your students will LOVE this.... the idea is to make them laugh, and help them to SEE why we have to listen and HOW to listen with their body. 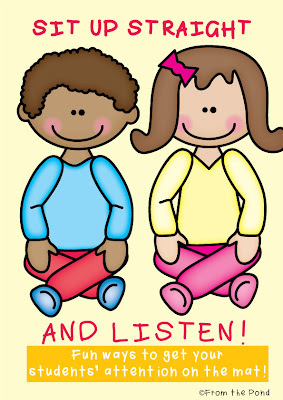 Tell your students you want to play a little game to show them how to listen at school. Tell them you need a brave volunteer to come to the front and role play with you. There will be laughs, so this person needs to have a willingness to perform and be laughed at! Tell this volunteer (with the rest of the class listening) that you are going to show the class how to be a good listener. That you are REALLY good at listening and that the rest of the class needs to learn to be good listeners. IN fact you will model bad listening - very bad! You will need to exaggerate it and make it very funny! Tell your volunteer (and the class) that you will ask them some questions and as they reply, you will show good listening. Ask a simple question, like “Tell me about your breakfast this morning”. As your students begins to talk, do an exaggerated head move and stare out the window. You will get some giggles. Look everywhere and all about, just not at your student that is talking. Eventually, say to the students....”am I being a good listener?”...they will say “no” and squeal with laughter at your funny acting! Ask them why not. “Oh, so I have to LOOK at the person talking - OK, I can do that!” Tell the students you will start again. Ask the volunteer the question again. This time do an exaggerated stare at your volunteer as she talks, but move your legs and arms wildly. Your other students will laugh trust me! Your volunteer will get distracted. Every time she starts to talk, move your arms and legs. When all your students tell you that you are not being a good listener, tell them “but I am looking at the person talking, you told me that is what good listeners do!”. They will tell you that you have to stop moving. “Oh, so I have to look at the person AND keep still, wow that is a lot to remember...OK....let me try again....must remember to look, and keep still”. Ask your volunteer the question once again “let’s gets this right” tell them. As your volunteer starts speaking, keep your arms and legs very still, look very intently at their eyes, but speak at the same time your volunteer does. Put a very concentrated, serious look on your face and speak at the same time, right to her face. Your students will laugh, and so might your volunteer. This time, model PERFECT listening. Once done, ask your students how you did and reinforce the 3 main things to do when listening. You can display the good listening poster that comes in my packet in your classroom to help your students remember this lesson - point back to it when you need to encourage good listening, they will remember the lesson, remember the 'actions' (so important as it makes it real, not just 'blah blah words the teacher is ranting' and be able to modify their behaviour. I like to use finger rhymes with actions to also help my students settle on the mat and get them ready for good listening. My packet includes 6 that are rhythmic, easy to remember, have actions and finish with listening behaviours as the focus. Teach these ones with your students and demonstrate actions to go with them. Whenever you need to settle your students on the mat ready for listening, you will have one of these to start and hopefully over time your students will know them perfectly and enthusiastically join in! What are your favourite ways to get your students listening?